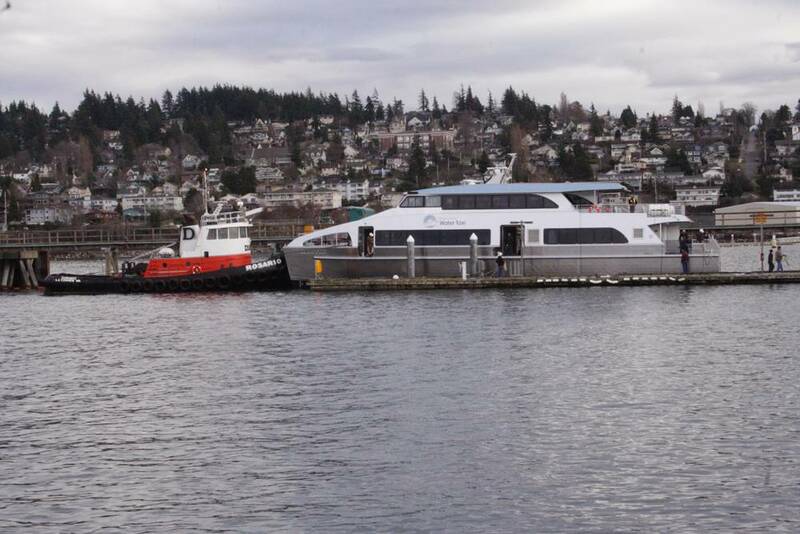 Joe Hudspeth, Vice President of Business Development at All American Marine, Inc.
King County Ferry District is set to take delivery of the very first ferry of 2015, the Sally Fox, as part of their water taxi service in Seattle, Washington. It all adds up to the global effort to strengthen bottom lines, safety margins and the collective environmental footprint. The future for ferries seems to be on fire; both in good ways and bad. The good is always a good place to start. And, that’s because it is ferry fabrication time. The most notable ferry routes in America are jumping into the construction queue for new vessels and soon the next generation of ferry vessels will be hitting the piers (not literally of course). From the Northwest to the Northeast, construction plans are not calling for more of the same, rather new classes of ferries are under design and in production. The Steamship Authority (Woods Hole), Washington State Ferries, and Alaska Marine Highways are all expecting new car ferries. 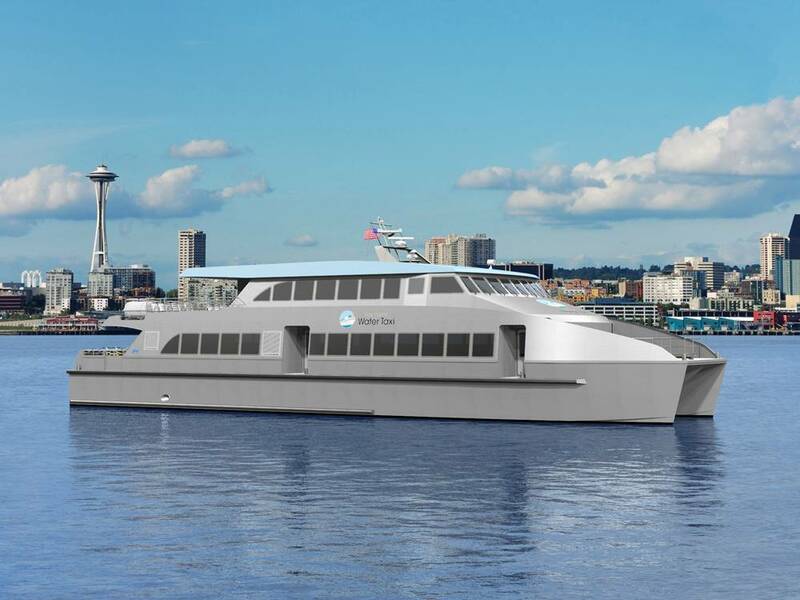 The San Francisco Bay Ferry (WETA), Massachusetts Bay Transportation Authority (Boston), King County Ferry District (Seattle), Hampton Roads Transit (Norfolk), and Staten Island Ferries will soon be receiving new passenger ferries on their routes. This is truly big news, as ferry construction has been furloughed for far too long. The fury of ferry fabrication also happens to come at a time when ferry design and ferry safety is under fire. Punching just about anything ferry related into an internet search browser of your choice will quickly yield reminders of the tragic Sewol ferry disaster that claimed over 300 lives. As this column goes to print, the news of at least 129 bodies being recovered from a capsized ferry in the Congo is also just being revealed. Sadly, ferry tragedies of this kind are not rare occurrences and poor ferry design, maintenance, and operation often makes the difference between death and life. The Worldwide Ferry Safety Association (WFSA) has initiated a grassroots effort to introduce safe and affordable ferry designs for problematic routes around the world. Each year, naval architecture students from universities spanning the globe, participate in WFSA’s ferry design competition in which a comprehensive vessel design and feasibility study is submitted based upon the featured route. A student team from Memorial University in Newfoundland won the 2014 competition with a new design that can make a difference for the Lae-Kavieng route in Papua New Guinea. The foundering of ferries is not just a foreign matter. Early last year, the National Transportation Safety Board (NTSB) released their “most wanted” list of transportation improvements and new to the list released last January, was the advancement of passenger vessel safety. NTSB states that “accident investigations involving passenger vessels revealed in numerous cases that the cause of an accident was not the failure of the vessel, but the lack of good safety practices that led to the loss of life and injuries.” Boat builders will attest that the design review and inspection services provided by the U.S. Coast Guard are extremely thorough and today’s vessels are the most seaworthy. On the surface, it appears as though the Coast guard may be expending more efforts on vessel inspection than crew member competency, which time and time again has been the root of the few, but significant ferry incidents in the U.S. While inherently safe, new ferry designs are not always an immediate success. And, problems do not always confine themselves to developing, underfunded nations and operators. For example, the nation’s largest ferry system, Washington State Ferries, recently introduced two new classes for various routes within Puget Sound that have experienced more than a few operational issues. Most of those challenges have subsequently been addressed and corrected. But, that situation underscores the need for all stakeholders – builders, designers and, yes, the operators themselves – to more closely coordinate on all aspects of a vessel’s ultimate mission set from the very outset. All of that said; it is also unfortunate that few praises are sung for the safe and on-time performance that makes up the overwhelming majority of WSF’s sailings. Perhaps WSF will achieve favorable recognition if they can implement a revolutionary LNG fueled propulsion system re-power project which they have been trying to fire up for the past four years. The project will remain permanently anchored until an amicable design solution can be reached with the Coast Guard, however. Along with WSF, other ferry operators will establish new “firsts” with current projects. King County Ferry District is about to receive a new 250 passenger ferry for Seattle, which will be one of the first U.S. Coast Guard inspected subchapter “K” passenger vessels built under the latest revision to the structural fire protection guidelines. San Francisco Bay Ferry is also pushing industry to reach EPA Tier IV emissions standards in their current construction solicitation for two new 400 passenger ferries – which is quite the challenge, especially given that the technology is still under development for the relevant horsepower range of this particular application. In rare instances, a ferry can be a magical conveyance to a new land otherwise unobtainable. The masses, however, are typically enslaved to ferry ridership as the only viable option to transit to various workplaces and chambers of commerce. There is no novelty for those who dwell on board as a notorious ferry commuter. Commuter culture is something to behold and identifying such frequent voyagers is an easy task. If you happen to counter their culture, they will let you know in one way or another – most commonly with rolled eyes, or in extreme situations, a horn may be honked. Those who embrace mass transit commuting take ownership of their vessel, favorite seat, and have a firm routine. Any disruption to the normalcy of their commute is bound to ruin an entire day. Kowtowing to the needs of the commuters goes far beyond high speed internet, convenient power ports, and serving Seattle-style coffee. Designing a ferry for the rider certainly has value, but operator’s can also exercise liberties or choose ignorance to a certain extent without risk of losing their captive ridership. While the needs of frequent ‘ferriers’ do hold some weight, they will be forced to take a back seat when the route is under public subsidy, as is the usual case. Mike Anderson, who once led Washington State Ferries, is now Director of Marine Transit at KPFF Consulting Engineers in Seattle. 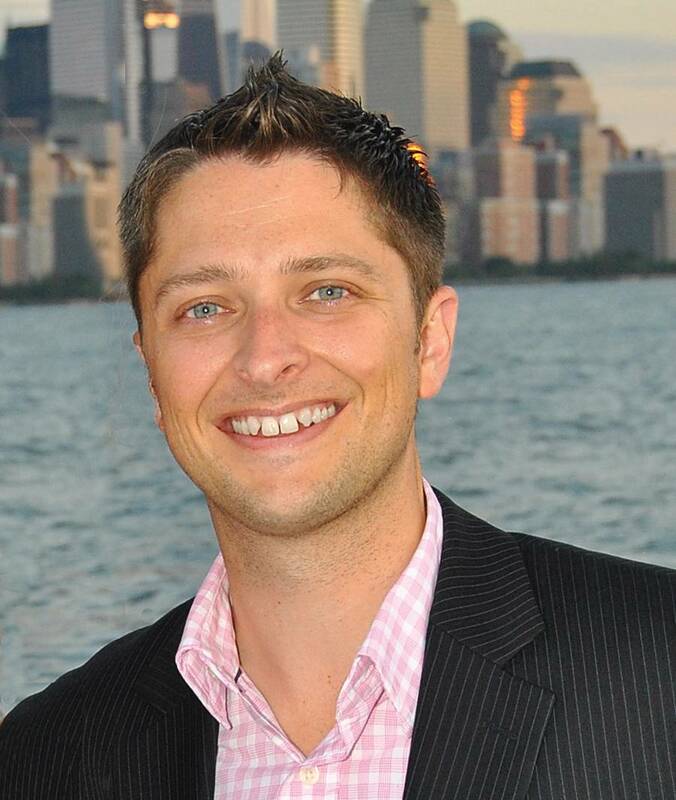 Anderson and his team specialize in a full range of consulting services for the ferry and water taxi industry, including guidance on getting in good with the customers. “Most successful operators primarily focus on serving the commuter first, ensuring adequate level of service and amenities to get the commuters to and from their employment centers across the water. Time savings has been found to be the most important factor for most commuters, of course followed by fare price and amenities offered,” states Anderson. Safety and the environment are not the commuter’s primary concern, but if those boxes also get ticked on their list, this often leaves little room for anyone to complain. Ferries will remain where bridges don’t make sense and shortening the distance between points A and B is a priority. We have to have ferries, must maintain them, and like it or not, they must be kept funded. Some grumble as to why the land lubber masses must support infrastructure used only by a few, but as the system becomes better, use will increase, and less congestion on the roads will ultimately benefit all intermodal stakeholders. The key to running a successful ferry will remain hard to turn, but collectively progress is being made and the next generation of ferries looks promising. For the latest insights on what is happening within the ferry industry, the Passenger Vessel Association is hosting their annual convention, Maritrends, year in Long Beach, CA January 31 to February 3.